Ramses clasping his enemies by the hair and smiting them with a club. He performs this act in the presence of Amon-Ra, who hands him a curved sword of victory at (e), and the hawk-headed Ra-Harakhte at (f). In fact, this division of the temple between Amon-Ra and Ra-Harakhte continues throughout its entire length. Most of the reliefs of the former are on the south side (left) of the temple, and those of Ra-Harakhte are to the north (right). Both sides of the hall are decorated with scenes of a military nature. The Great Battle Scene is on the northern wall (g). It covers an area of 18 metres in length and 8 metres in height. It is one of the most extraordinary and detailed reliefs to be found in the Nile Valley. There are over 1100 figures depicted and the entire wall space from the ceiling to the bedrock is filled with activity: the march of the Egyptian army with its infantry and charioteers, hand- to-hand combat, the flight of the vanquished, prisoners, slain, wounded and drowning enemy. There are overturned chariots, riderless horses and farmers anxiously driving their cattle into the hills. There are scenes of camp life and inspection of officers. Here in a single mural is all the pomp and circumstance of war. With their traditional stress on balance and symmetry, the artists have separated the wall into registers. Between the war scenes above and the Egyptian army below, is a frieze of charging chariots at full gallop. On the lower half of the wall, between the two doors (1), are scenes of Egyptian camp life. The camp is square and enclosed by a stockade of soldiers’ shields. The royal tent is shown, and at the centre of the camp is Ramses’ pet lion that is cared for by a keeper. Horses are being fed in rows from a common manger. Some wait impatiently pawing the ground. Others lie down. Some are being harnessed. One horse scampers around the enclosure. One makes off dragging an empty chariot, pursued by a couple of grooms. There are joints of meat (in the corner) and a tripod brazier. Soldiers eat from a common bowl as they crouch on their heels. One officer is having his wounded foot dressed by a doctor. Another sits with his head resting on his hand. Hurrying towards him is a soldier bringing news of the battle. 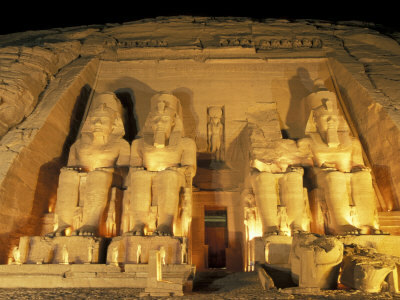 To the right (2) the seated Ramses holds a council of war with his officers. In the lower register (3) two spies are being interrogated. According to textual evidence, these two men of the Shasu tribe came into the Egyptian camp then situated in the land of Tchal, not far from Kadesh. They claimed to have been sent by their chiefs to inform Ramses that the Hittites wished to come to terms with the Egyptian army. They declared that the enemy were yet some distance away and afraid to make contact. The two men were, in fact, sent by the Hittite leaders with false information in order to establish the exact position of the Egyptian army. At that very moment, the enemy was actually drawn up in full battle array behind Kadesh. No sooner had the men been dismissed than an Egyptian scout requested urgent presence with the king and brought the two spies with him. They finally admitted that the chief of Kheta was encamped behind Kadesh with soldiers and chariots ready to strike. 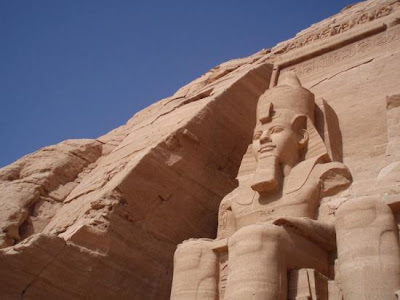 Naturally Ramses blamed his own intelligence for neglect of duty, and after admitting their fault, the Egyptian army made immediate preparation to march on Kadesh. The clash of arms is depicted on the upper reaches of the wall, where the river Orontes winds through the picture and almost surrounds the beseiged city. Commanding the scene is Ramses II in a pitched battle (4). Watching the scene from the strongly defended fortress of Kadesh (5) are some of the enemy who peer from the embattlements. Ramses stands undaunted in his chariot surrounded by the enemy. With the sure confidence of a warrior, he whips up his horses and dashes into the Hittite ranks, launching arrows at them and crushing many beneath the wheels of his chariot. Among the slain and the fallen are some who beg for mercy. So wonderful was his bravery that a poem composed by Pen-ta- urt was inscribed on the walls of many of the temples Ramses built. It recorded for posterity how the great pharaoh, in full armour and mounted on his chariot, drove into battle with a ‘growl like that of his father Montu, Lord of Thebes’. How, suddenly finding himself completely surrounded and cut off from his own troops, Ramses called on the name of Amon-Ra, whipped up his horses and slaughtered the enemy until some fell ‘in great heaps on the ground’ while others fell one over the other into the waters of the Orontes. Quite alone and with not one of his infantry to help him, Ramses thus succeeded in forcing his way through the enemy ranks. On the extreme right (6) the king, still in his chariot, inspects his officers, as they count the severed hands of the enemy and bring in fettered prisoners. The walls to the rear of the hall show Egyptians leading rows of captive Hittites towards Ra-Harakhte and his own deified figure at (h); rows of captive Nubians are presented to Amon-Ra, Ramses, as a deity, and Mut at (i). (The large chambers leading offthe Hall were probably storerooms; the reliefs are of inferior quality). The Hypostyle Hall (2) has four supporting square pillars. The reliefs are of offerings made by Ramses II to the various gods, one of which is the deified Ramses II himself, and various ritual scenes that show the sacred barge of Amon-Ra and accompanying priests. Following the Hypostyle Hall is an ante-chamber (3) and the Sanctuary. The Sanctuary (4) contains four seated statues: Ptah, Amon-Ra, the deified Ramses II, and Ra-Harakhte. The temple is so oriented on an east-west axis that the rising sun sends its rays to strike the rear wall of the sanctuary, 47 metres back from the entrance, or 61 metres inside the mountain surface. At certain times of the year the rising sun illuminates the sanctuary and shines on the four seated statues. Much has been said about this phenomenon; though in fact even when the sun’s rays pass through all the entrances of the chambers, the sanctuary wall and the four statues are never fully illuminated. Twice a year, however, for 25 days after the autumnal equinox of September 23, and 25 days before the vernal equinox of March 20, the axis of the temple enables the statues to be illuminated — though never more than two at a time. 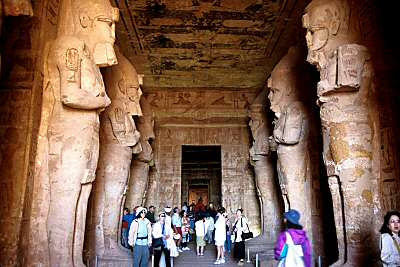 The most that can be seen is on February 26th and October 18th when the sun shines on the statues of Amon-Ra and Ramses, with the light touching the sides of the flanking statues of Ptah (on the left) and Ra-Harakhte (on the right). The Great Dome Access is gained via a stairway to the right of the temple that leads to a gallery, from which this impressive, weighty, concrete shrine can be seen from the inside. It was designed to relieve the temple structure below from the very heavy load of the overlying rock walls and rockfill and also to make possible inspection and repair (if necessary) from the rear. It represents a unique technological achievement. Owing to its size and the complex nature of its load, it was necessary to carry out measurements of stress, strain and deformation, in order to check the behaviour and the safety of the structure. Also, to make calculations to evaluate its long-term behaviour and durability. The height of the dome is 25 metres and the cylindrical part has a free span of some 60 metres. This single span is destined to bear a load of about 100,000 metric tons, and its durability must at least match that of the temple it shelters!